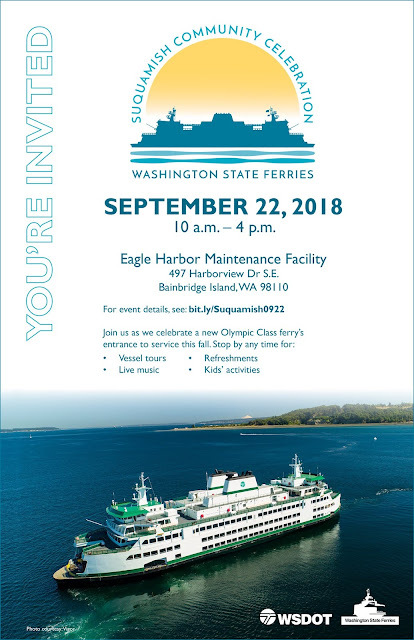 Help us welcome our newest Olympic Class vessel, Suquamish, to our ferries fleet by joining us on Saturday, September 22 on Bainbridge Island for a community celebration! This event is free and open to the public. Stop by any time during the event for vessel tours, live music, kids’ activities, and free refreshments. Suquamish is the latest of four Olympic Class ferries that are replacing some of our oldest vessels. Tokitae debuted in 2014, Samish joined us in 2016, and Chimacum in 2017. These vessels carry 144 vehicles and have a variety of improvements over our older vessels, including wider car deck lanes, improved access and safety, increased passenger comfort and a reduction in environmental impact and operating costs. The new vessel will go into operation this fall on the Mukileto/Clinton route but will be used as a maintenance relief vessel, filling in when other vessels are out of service, during the winter. Walking: The event location (pdf 4 mb) is about a 10-minute walk from both the Bainbridge Island Ferry Terminal and downtown Bainbridge Island. Parking: There is ample parking at, near the ferry terminal and in the downtown area. Shuttle: Thanks to Kitsap Transit, attendees can catch a shuttle from the ferry terminal to get to the event. ADA Accessibility: ADA parking and a pick-up/drop-off area will be available at the Eagle Harbor Maintenance Facility. From Seattle: The Seattle/Bainbridge sailing schedule is available online. We are committed to providing equal access to facilities, programs and services for persons with disabilities. To request disability accommodations for this event, email the ADA Office at least 10 days in advance at wsdotada@wsdot.wa.gov or call toll free 855-362-4ADA(232). Persons who are deaf or hard of hearing may make a request by calling the Washington State Relay at 711. Route 90 is the only one that operates on Saturday, with a third of its weekday runs, and only from 10:30a-4:30p. 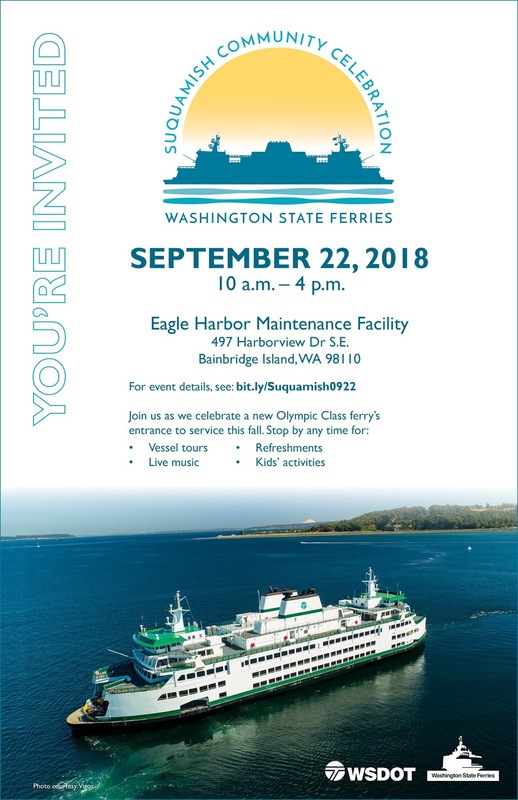 The event can also be accessed from Clallam and Jefferson Counties by riding The Strait Shot, Clallam Transit Route 123, to Bainbridge Island Ferry Terminal.